Housed in the specially refurbished Victorian Wing of the Ipswich Museum and Art School Gallery, the Think Tank is a building based resource for the ongoing public exploration and study of live performance and other associated areas. Re-imagining three Victorian classrooms for the 21st Century, a rolling programme of accessible affordable public events, led by artists and experts from a range of diverse fields, offers you great ways to come and spend time in creative comfortable surroundings. The Think Tank’s unique and accessible programme invites communal participation the in arts by offering a range of interdisciplinary events and activity. Here you can join artists, scholars and professionals from multiple industries as well as other experts and non-experts in the exchange and transfer of skills, experience and ideas. Groups and events such as coffee mornings offer a relaxed setting, inviting the chance to network, uncover new relationships and share thoughts. Courses and workshops are fun, practical and interactive, Structured to suit different ages, they teach new skills and techniques. Think Tank Feasts welcome artists and non-artists, experts and newcomers to break bread together, while hearing from a variety of specialist guest speakers. Salons and artist talks are thematic discussions that invite audiences to participate in open-ended, group conversations. Guest experts field open sessions and present themes or territories relative to their own areas of work. All questions are welcomed, but simple answers aren’t always guaranteed. The Think Tank is also an incubator space that enables artists to spend time in residence, investigate crossovers with radical art practices and culture at large, and to engage with peers and members of the public. 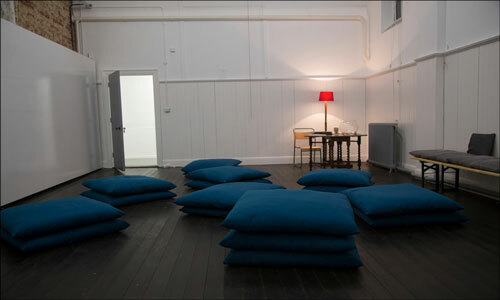 Applications for Think Tank residencies can be found here. The inspiring and versatile spaces within the building can also be hired for a range of uses including creative purposes, social gatherings and parties, or professional meetings including teleconferencing. A tiered pricing structure ensures that a wide range of budgets and requirements can be accommodated, from independent artistic practice to bespoke facilitated public events. Click here to find out more.